1. Extensive port facilities handle more than half of Queensland's exports -including its entire wool clip- and the great bulk of its imports. Local industries include oil refining, tire manufacture, heavy and light engineering, meat and fruit packing, and sugar refining. 2. 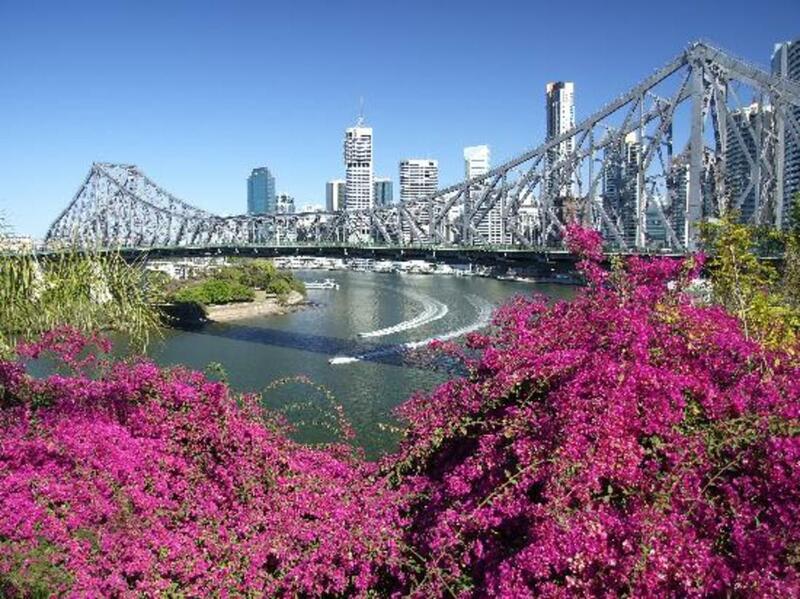 A beneficent climate, inviting comparison with Florida and southern California, inspired developers to promote southeastern Queensland as a resort and retirement region for people living in Australia's less favored southern cities. 3. 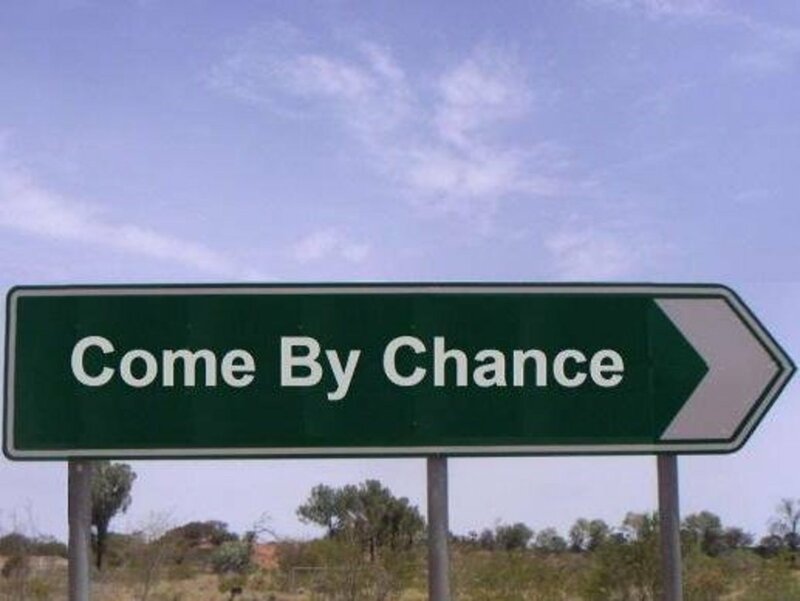 A significant element in the growth of Brisbane's economy and population has been its proximity to two burgeoning oceanside beach strips near the metropolitan area: the Gold Coast to the south and the Sunshine Coast to the north. 4. 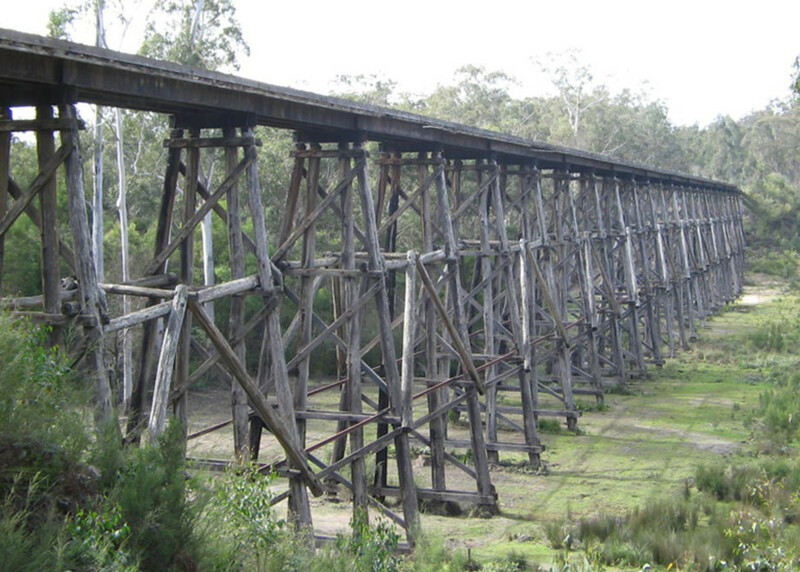 The city and its far-flung suburbs spread along and out from the lower reaches of the winding Brisbane River, which empties into the blue-green waters of Moreton Bay about 10 miles (16 km) east of the central business district. 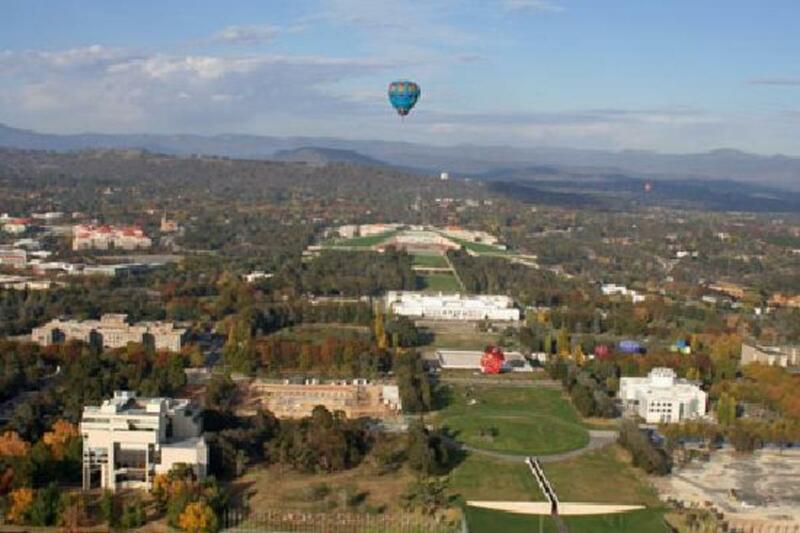 On the west a range of misty blue hills that rise to Mount Coot-tha provides a striking backdrop for the city. 5. The city core occupies about 1 square mile (3 sq km) within a sweeping bend of the river. Until the 1970s the City Hall's 100-foot (30-meter) tower was the most prominent building, but it was later dwarfed by numerous commercial high rises. 6. To the north lies the smaller commercial center of Fortitude Valley, beyond which stretch extensive residential suburbs. Three major bridges connect the downtown area with industrial South Brisbane and suburbs farther to the south. Eastward, other suburbs extend to Moreton Bay, with major residential development to the southeast along the shore. Westward, Mount Coot-tha's brush-covered slopes have confined urban spread to the corridor of the lower Brisbane River. 7. In the older, inner areas, shop and factories intermingle with houses, many of which have wide verandas and high wooden foundations. The newer outer suburbs form strings of communities where tract housing and associated shopping centers have absorbed many coastal-plain farmlands. 8. 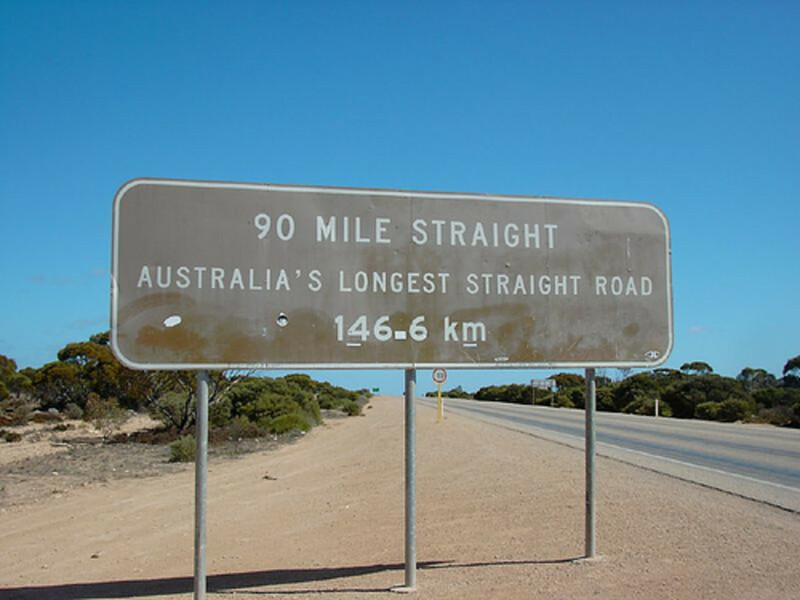 Although Brisbane and its suburbs are home to half of the people of Queensland, this concentration is less pronounced than in other state capitals. Furthermore, in contrast to Sydney and Melbourne, Brisbane did not become a major destination for overseas immigrants reaching Australia after World War II. 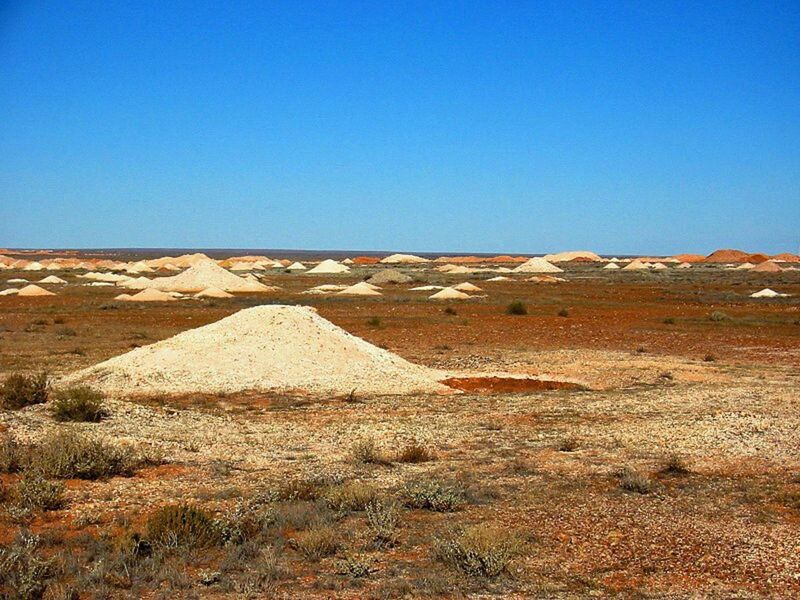 Consequently, population growth continued to come from within the country, and Brisbane missed taking on the multiethnic character of Australia's two major cities. 9. 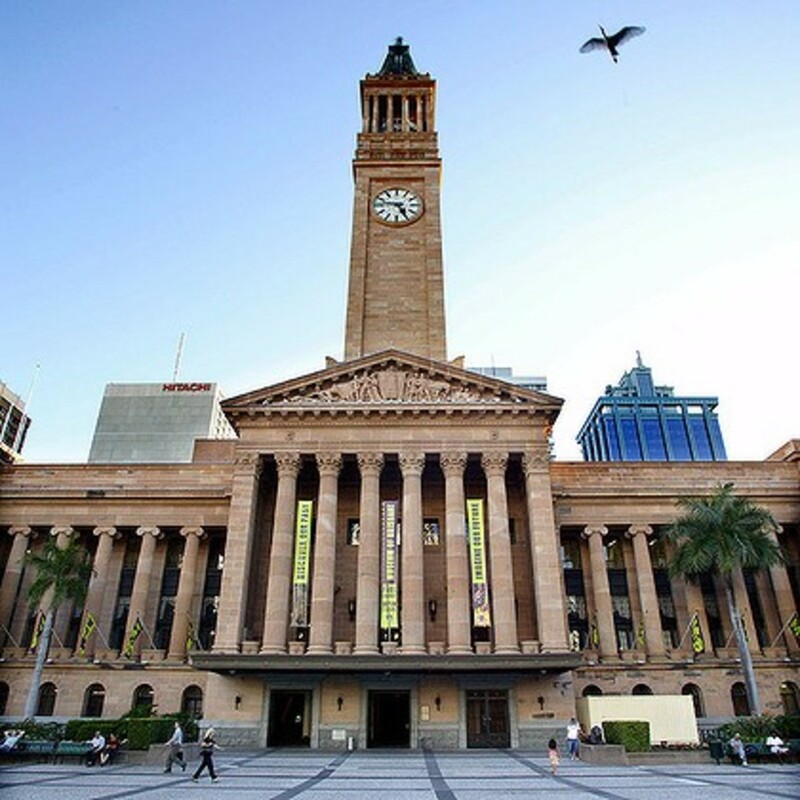 The imposing City Hall (1930), built of Queensland freestone, marble, and granite, stands within a site of more than 2 acres (0.8 hectare) and contains a 2,500-seat circular auditorium. 10. 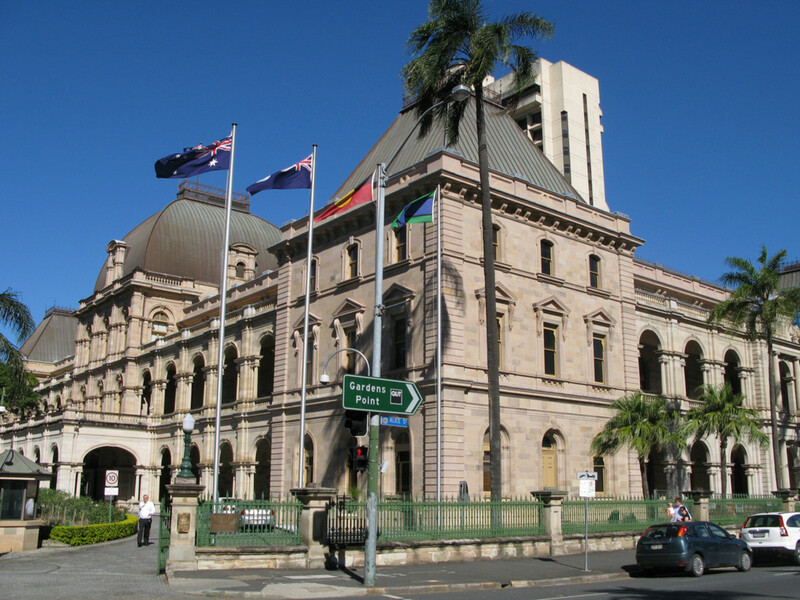 Other notable buildings in Brisbane are the state Parliament House (1868, with arches and colonnades added in 1880), the Customs House (1886), and the Queensland National Bank (1885), with its central chamber domed in stained glass. 11. Anglican and Roman Catholic cathedrals, as well as numerous fine churches, distinguished the city. 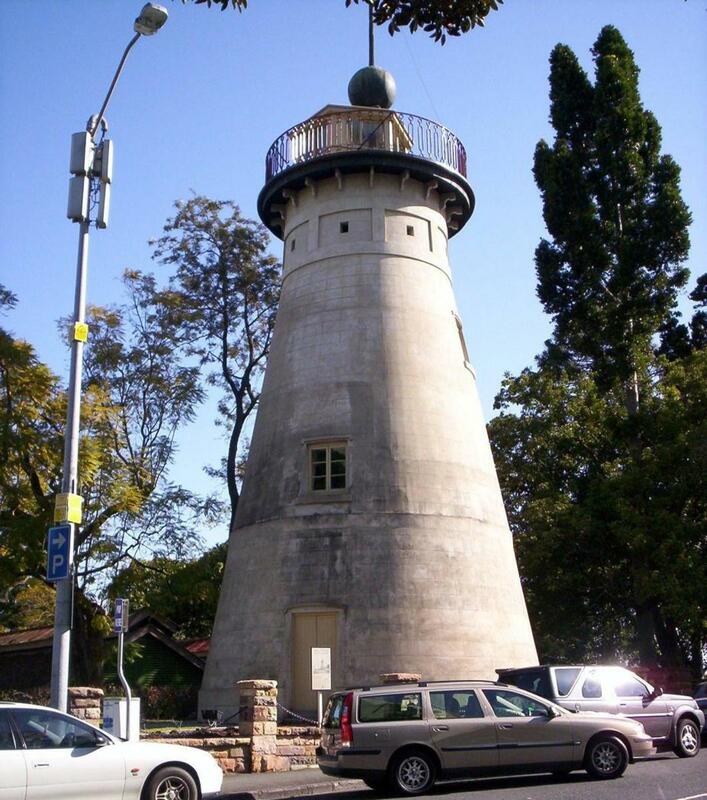 Six restored 1880s townhouses ("the Mansions") and the Old Windmill or Observatory (1828) are landmarks. The war memorial, in Anzac Square, is an open colonnade within which a flame of remembrance burns. 12. Of the many parks, the botanic gardens on an inner-city bend of the river include planted stands of tropical rain forest. The Mount Coottha botanic gardens feature landscaped areas of Australian trees and shrubs. 13. The University of Queensland and Griffith University are in Brisbane. The Queensland Cultural Centre houses the state art gallery, museum, and library, as well as a performing arts complex. 14. Brisbane was founded as a penal settlement, established in 1824 on Moreton Bay and moved upriver to the city's present site the next year. In 1839, Brisbane's use as a penal outpost ended, and the area was opened to free settlers. 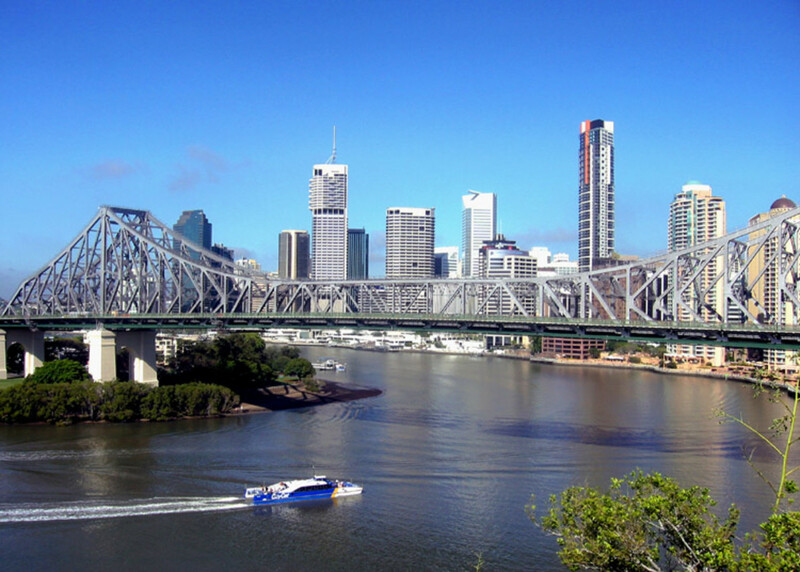 When the colony of Queensland was split off from New South Wales in 1859, Brisbane became its capital. 15. The Greater Brisbane Act unified 19 formerly separate municipalities in 1924. During World War II the city was a major Allied supply base and military headquarters. After the mid-1950s Brisbane grew rapidly, aided by Queensland's successful search for oil, coal, and minerals, and later by the rise in tourism. 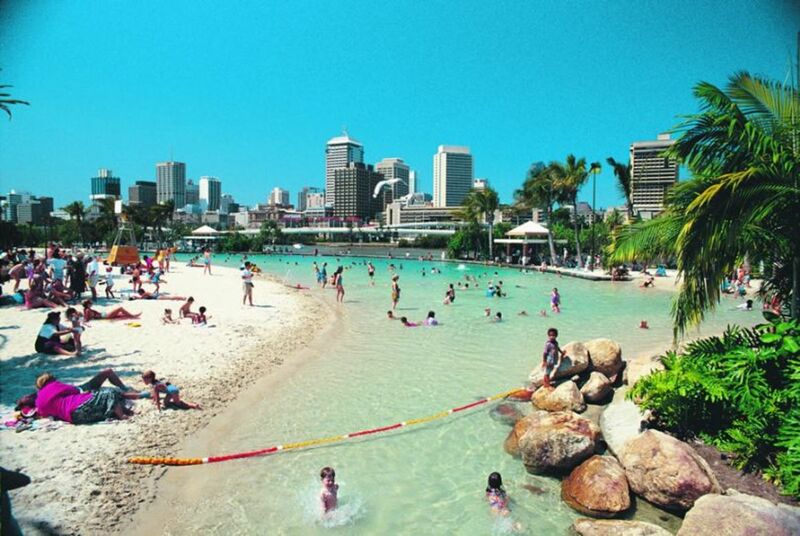 In 1988, on an elaborately prepared riverside site, Brisbane hosted a world fair, Expo 88.